A recent episode of NBN4's "Out of Town" featured Cardona and Tanay towns of Rizal province capped with a lunch at Kainan sa Dalampasigan where the host ordered sinigang na ulo ng bighead. On seeing the bighead, it brought back memories and a longing to again taste the bighead fish in sinigang since the fish, raised in Laguna de Bay, is also available in Paete's public market at an unbelievable price of P50/kilo. Big head, scientific name: Hypophthalmichthys nobilis, is also called chinese carp referring to it's Chinese origin but now raised worldwide. It naturally feeds on plankton and similar to whale sharks as filter-feeders. It's also said to be the most widely eaten fish, considered a delicacy in China and yet it's virtually unknown in Metro Manila-- no wonder it comes at a price cheaper than galunggong (round scad) and tilapia! Last Sunday morning in Paete, Tutubi requested his father to buy a whole bighead carp, still alive and...swimming, as always the case, in a tub filled also with carp and tilapia (the pla-pla variety, not the newer Gloria). 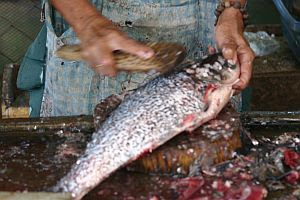 At P50/kilo, the 1.8 kilogram bighead was offered for only P80 and the vendor cleaned the fish's tiny kaliskis (scales) and chopped it into pieces. What became of the fresh bighead was a slightly spicy sinigang with its sour, spicy soup! Bighead carp is tasty and fatty, the healthy type of fat that is, available in restaurants in Cardona and Tanay, Rizal province, near the historic parola (lighthouse) but if you want to make it yourself, you can whip up your own wicked sinigang for less than P200 to serve at least five persons. Beat that for a truly frugal feast! 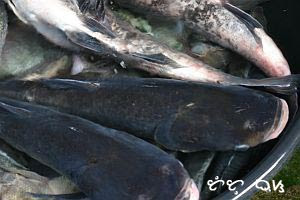 i have never tried sinigang carp before but i have eaten it steamed, coated with black bean sauce with chili. sarap talaga! i've never eaten sinigang carp too, usually, sinigang na bangus. But it sounds delicious! I've never tasted sinigang carp before but it looks good in the photo. But I'm the type who's afraid of fishy smell. Hehe. To be honest I like the food but not the killing! Wow, looks and sounds very tasty! napaka fresh naman tignan ng mga isda, sigurado akong masarap ang mga iyan, penge! I love the look of that spicy sinigang man ! looks yummy. what does "filter-feeders" mean? 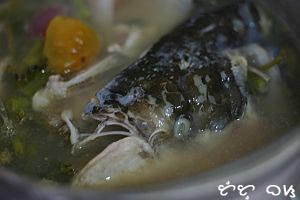 Ay, ang sarap, I'm craving for sinigang carp right now! Kasawa na ang bangus. hi tutubi! yan din ba ang tinatawag na dalag sa atin? i never had sinigang na carp, mukhang ang sarap, yyummm!